Still continuing with the post SVA mods its time to remove the weird looking indicator stalks from below the headlamps, fit the fly screen accompanied by the race tech mirror which was a bit too sharp for the SVA and fit a fire extinguisher just in case of a fire. Being a lovely Saturday morning it started out as a pleasure to fit the 800g fire extinguisher made for liquid and electrical fires. It came with a mounting bracket so I lined it up with the seat and checked it could be removed without the seat getting in the way. The bracket has 2 pre drilled holes so these were transferred to the floor drilled and the job was done, easy! The indicators have been mounted on bars made from copper pipe and plumbing fittings - not ideal although they got us through the SVA test. To relocate them we removed the headlights and the associated wiring. Next the nose cone had to come off and we found a nice spot for the indicators to go which we chose as its inline with the headlight bar and as far back as possible to miss the radiator. At the same time I gave the front end a good clean down as its so hard to reach with the nose on. The fly screen came with the kit but we were concerned it could cause radius issues because of its fairly sharp edge. This is the same for the rear view mirror as its got sharp edges and looks 100 times better than the current one. The screen itself started with a massive lip that when I sat in the car I couldn't even see over so it was trimmed to half its size. We drilled 8 holes and burred them out so we could fit flush bolts. The fitting of this part was a hell of a task because firstly the scuttle had to be removed for access, the position of the holes are right where the MNR scuttle comes back on itself and is really tight to get to plus most of the holes are obscured by wiring. After this was on Dad had a crack at getting the new Race Tech centre mirror on. A fairly simple job of drilling a hole for the mount, fitting the lower part from the bottom and then the main part from the top. The mirror is a lot smaller and higher up which really helps with the view of the passenger side wheel and there's a night and day difference with the actual rear view. With the old unit, above 50mph the old one would fall back and give a nice view of the handbrake whereas the new one is vibration free and fixed in position. Were now starting to use the car for longer journeys where some boot space would be really handy. 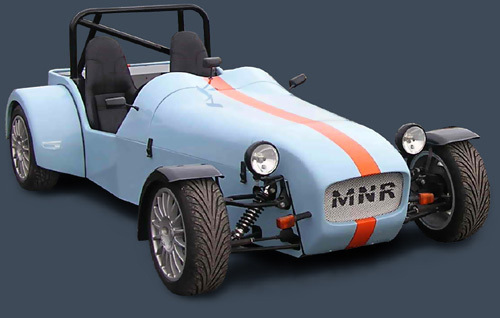 We got an MNR boot box thrown in with the deal when the kit was picked up in December 2007 but whilst fitting the body work we test fitted it and realised it was never going to fit. 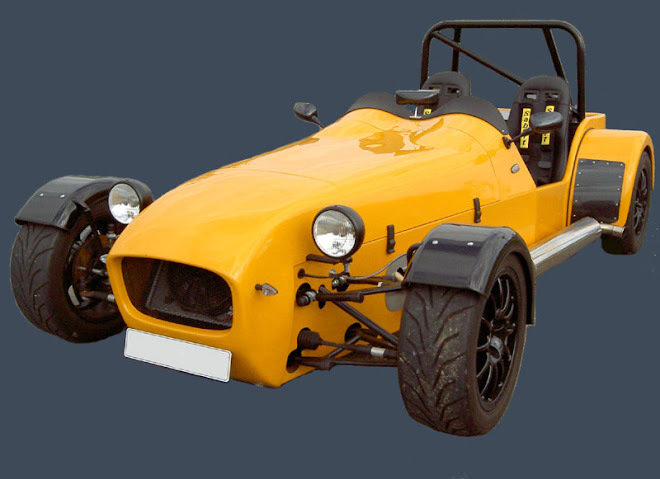 Firstly it’s too deep, it doesn’t clear the fuel filler hose and the sender wiring, its also not long enough to attach it to the chassis by the seat belt brackets. We could have binned it but then we wouldn’t know where to start so instead we are attempting to chop the one we have and use fibre glass to remould it to the correct shape. We started cutting out sections that were causing it not to fit. Once we were finished it barely resembled a boot box. We then used the off cuts to fill all the holes made and taped into postion ready to fibre glass over. Its horrible stuff so I wore gloves to do the messy work and dad was armed with a paint brush and lollipop stick to mould it into position. Resin is mixed with a hardener to make a quick setting glue. This mixture is applied to sheets of glass fibre matting until soaked and then it can be wrapped around the subject. It didn’t go 100% as planned with a few air bubbles but after it set it was incredibly sturdy. It was a really long job so were leaving it till another day to finish off. Next up is the weak flexing MNR paddles which can make it hard to get into gear. The current one is 3 pieces bolted together to be adjustable. As we knew our steering wheel size we decided we wanted a once piece. We used the existing one as a template and traced around it onto paper then hardboard. When we were happy with a design we dropped it off with Dad’s cousin to be made in thick steel. Hi, Just a quick one to let everyone know its still going well and just to prove it heeres a short video of myself giving it some stick on the country roads.